Holiday Vegetable Trays are festive, easy to make, healthy & delicious! Add fun to your Christmas table with one of these great veggie tray ideas. Fun fruit tray ideas also featured! Holiday Vegetable Trays are a great idea to bring to a Christmas potluck or get-together. They’re easy to make and everyone seems to find at least one thing on the tray that they enjoy. There will come a time, I promise you, when you will be asked not to bring fudge or toffee or some other delicious butter-laden treat to a holiday party but rather a vegetable tray. Yep, that’s right. And you know what? It’s okay, because you can make that veggie tray the most festive veggie tray ever to grace your neighbor’s annual white elephant gift party. Here are some ideas on how to do just that. I present to you- a holiday Festival of Vegetables if you will…with a bit of fruit and cheese added in for fun. Many of these don’t necessarily come with instructions. From my own experience, start with green- I used sugar snap peas outlined in broccoli florets. Then add color around it and “ornaments” on top of it. Everyone loved the olives! I cheated and made my veggie dip from a Ranch dressing packet too- so easy. I did try and make it a little more creative by putting the dressing in a hollowed-out bell pepper. Have fun and get creative! Shout-out to Crisp Cooking for having awesome kitchen tools! This straight paring knife is a favorite. For my platter above I wanted to make a simple Christmas tree. I started with green vegetables for the base and made the general shape of a Christmas tree. Then I added olives and grape tomatoes on top for ornaments and sliced bell pepper for garland. I put baby carrots around it for some additional color. I served ranch dressing in a hallowed out bell pepper. Everyone loved it! Simple Christmas Tree Veggie tray made fresh & festive for the holidays! Easy to design and arrange your own Christmas tree out of fresh vegetables. Start with green vegetables for the base and made the general shape of a Christmas tree. I used broccoli but sugar snap peas work well too. Add olives and grape tomatoes on top for ornaments. Slice bell pepper for garland. Put baby carrots surrounding the tree for some additional color. Serve ranch dressing in a hallowed out bell pepper. This cute snowman has a ranch dressing-in-a-bowl head complete with olives for his face and a carrot nose. Quartered mushrooms in a bowl make up the middle snowball with a few sliced olives for buttons. The final bottom snowball is made from pieces of cauliflower. Additional vegetables are added around the sides for color! This simple but elegant Christmas wreath vegetable tray is made from stems of asparagus, carrots and celery with some bell pepper and zucchini slices on top. Remember to blanch the asparagus first- I like to boil water in my tea kettle, then pour it on top of a quarters baker sheet where I’ve placed washed and cut asparagus. Let them sit in the boiled water for about 5 minutes, then pour off the water and chill the asparagus. You can blanch the asparagus up to 2-3 days ahead of when you plan to use it. You blanch the asparagus so it’s more tender and easier to eat. Otherwise it’d be very crunchy and woody- not tasty at all! This Santa Veggie Tray is pretty cute! Santa here is made with red bell pepper strips for his hat, a cauliflower brim and peeled cucumber slices for his face. His beard is made from more cauliflower and grape tomatoes make up the top part of his Santa suit. 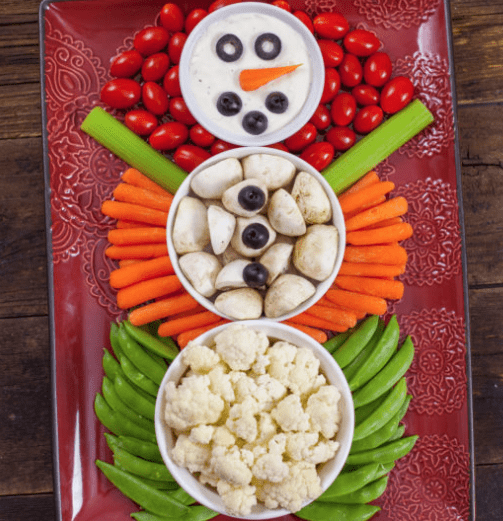 I love this standing Snowman Veggie Platter! FUN! Standing vegetable platters are a bit tricky to make but SO cute! What you’ll do is take 2 heads of cauliflower and turn them horizontally. Use toothpicks to stack them together and then place his carrot nose and olive eyes with additional toothpicks. Other vegetables like bell peppers and cucumber spears are positioned around with kale for added greenery and fullness. This is a simple Christmas tree made from broccoli and grape tomatoes with cauliflower and carrots around the perimeter to complete the picture. Hollowed out bell peppers at the bottom hold more carrots, tomatoes and ranch dressing. I love this darling Christmas tree made with simple layers of cut vegetables. Broccoli, different varieties of tomatoes, cucumber, cauliflower, celery and bell peppers make up this darling tree. This simple tree is made from sugar snap peas and a celery stalk. Grape tomatoes dot the tree as ornaments. It just goes to show, your veggie plate doesn’t have to be elaborate to be festive! This Christmas tree vegetable platter is made from broccoli and grape tomatoes. Slices of yellow bell pepper make up the star adorning the tree. They’ve also placed stick pretzels as the tree stem and “snow” on the ground made up of cauliflower. 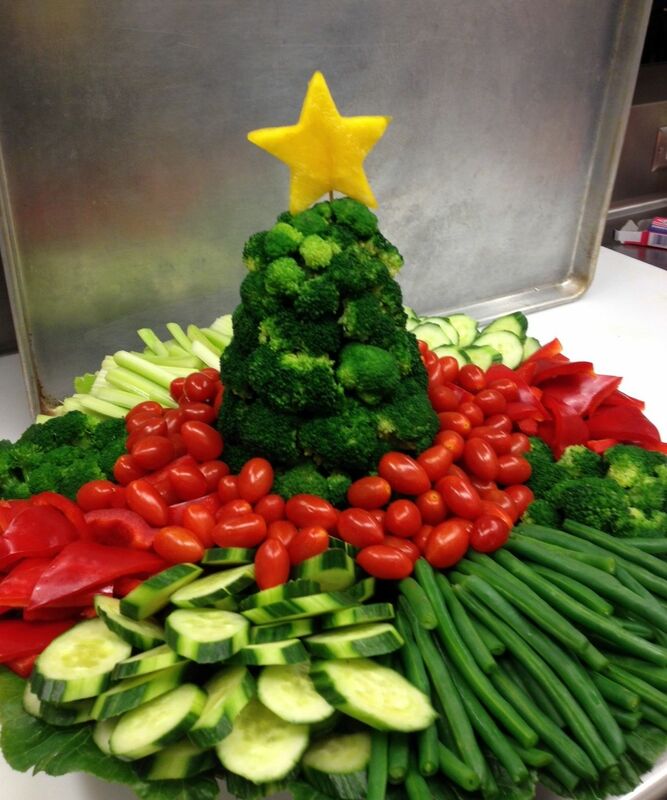 This Christmas tree vegetable platter is made from broccoli, grape tomatoes and sliced of red bell pepper. Yellow bell pepper was used to make the star adorning the tree. Stalks of celery make up the tree stem. This 3-D standing Christmas tree is made by arranging broccoli and broccoflower around in a circle, using a toothpick to fasten layers as needed. Pearl onions, tiny tomatoes and yellow bell pepper stars are the ornaments with strips of bell pepper acting as garland. Cauliflower is arranged around the base as snow. This 3-D standing Christmas tree is made by arranging broccoli around in a circle, using a toothpick to fasten layers as needed. A pineapple star sets on top of the tree and mounds of fresh, colorful vegetables surround the tree on the platter. The ingredients for this veggie tray are pretty simple. Start by cutting your cauliflower into small bite-size pieces. Place them on your tray and then arrange into a snowman shape. You will also need additional veggies to surround your snowman. We chose carrot sticks for the top portion, because Olaf has a carrot for his nose and it was a cute match! Chop and peel whatever veggies you like and place them around Olaf. We used pretzel sticks for his arms and hair. I broke apart one pretzel stick and used it for his fingers. For the face, you can draw your own Olaf eyes, nose and mouth, then affix it to the top of your snowman. This simple Christmas tree ornament veggie tray is made from arranging each vegetable in rows on a circular tray. Cut out the ornament topper and affix a hook to the top for the final touch! Crescent rounds are baked and arranged in a circle, then topped with an herb cream cheese spread and fresh vegetables to make this cute Christmas wreath. This cute and tasty Christmas Wreath is made from grape tomatoes stuffed with fresh mozzarella balls and arranged on a bed of basil. This elegant Christmas Wreath is made from grape tomatoes and fresh mozzarella balls arranged in a circle on a bed of basil. Shake some salt & pepper on top and add a bowl of balsamic vinegar in the center to complete the dish. This Christmas wreath vegetable platter is made from broccoli, grape tomatoes, cucumbers and slices of red and yellow bell pepper. Red bell pepper was used to make the bow adorning the wreath. Ranch dressing is placed in a bowl in the middle. This Christmas message vegetable platter is made from broccoli, grape tomatoes, cauliflower and radishes to spell the word JOY. Yellow bell pepper was used to make the stars. This cute Christmas tree made from kiwi and raspberries is more the size of a lunch offering, but it’s so fun! This lovely Christmas tree made from kiwi and strawberries is the perfect addition to any holiday table! Iowa Girl Eats shows us how exactly to make these cute 3-D Fruit Christmas Trees! She affixes orange slices, grapes, berries and kiwi together using toothpicks to make a Christmas tree. 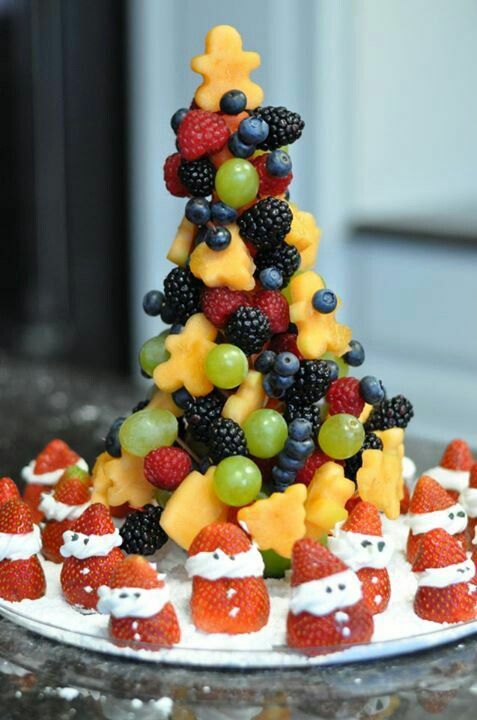 Mandarin orange slices, grapes and white cheese cubes are layered to form this simple Christmas Tree. Crackers line the bottom to make the picture complete. She affixes cantaloupe shapes, grapes, and berries together using toothpicks to make a Christmas tree. The strawberry Santas encircling the tree are darling! Watermelons are hollowed out and a melon baller is used to make this super cute Snowman fruit salad! I love the added blueberries for more color! This simple Christmas tree fruit platter is made from sliced granny smith apples, green grapes and berries. You’ll need a basic Christmas tree shaped platter for this cute Christmas fruit platter. Arrange chunks of honeydew melon and cherries in the platter to make the tree. This elegant Christmas Wreath is made from grape tomatoes, olives and fresh mozzarella cubes arranged in a circle on a bed of fresh rosemary. Grape tomatoes, a variety of cheese cubes and fresh rosemary make up this darling Christmas tree cheese platter. Holiday Vegetable Trays are festive, easy to make, healthy & delicious! Add fun to your Christmas table with one of these great vegetable/ fruit tray ideas. Oh veggie tray,<br />Oh veggie tray;<br />My heart delights<br />In thee today….<br /><br />(Sing it to the tune of &quot;Oh Christmas Tree&quot;–funny!). All kidding aside, those are some really great ideas for vegetable platters. I&#39;d be just fine curling up with one of those to munch on. Love this ideas – thanks for sharing!